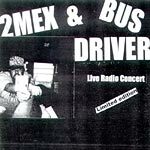 Limited Edition of a 48 minute live broadcasted performance by Busdriver and 2Mex. Classics, alternate versions and unreleased songs! CDR.